Updates the extent of the boundary when adding new raster datasets to a mosaic dataset that extend beyond its previous coverage. Boundaries can only be generated for mosaic datasets stored within a geodatabase. If you remove or add rasters, or modify the extent of the footprints, you should use this tool to rebuild the boundary. If you modify the shape of the boundary polygon (using editing tools), you can use this tool to recreate the original (unmodified) boundary. Select the mosaic dataset where you want to recompute the boundary. An SQL query to compute a boundary for select raster datasets. Use this option in conjunction with setting the append_to_existing parameter to APPEND to save time when adding new raster datasets. Set this to APPEND when adding new raster datasets to an existing mosaic dataset. Instead of calculating the entire boundary, APPEND will merge the boundary of the new raster datasets with the existing boundary. OVERWRITE —Recompute the boundary in its entirety. 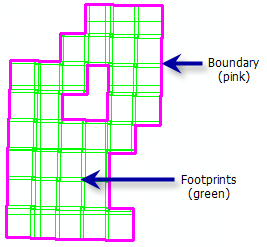 APPEND —Append the perimeter of footprints to the existing boundary. This can save time when adding additional raster data to the mosaic dataset, as the entire boundary will not be recalculated. If there are rasters selected, the boundary will be recalculated to include only the selected footprints. This is the default. The simplification method reduces the number of vertices, since a dense boundary can affect performance. Choose which simplification method to use to simplify the boundary. NONE —No simplification method will be implemented. This is the default. CONVEX_HULL —The minimum bounding geometry of the mosaic dataset will be used to simplify the boundary. If there are any footprints that are disconnected, a minimum bounding geometry for each continuous group of footprints will be used to simplify the boundary. ENVELOPE —The envelope of the mosaic dataset will provide a simplified boundary. If there are any footprints that are disconnected, an envelope for each continuous group of footprints will be used to simplify the boundary. This is a Python sample for the BuildBoundary tool. This is a Python script for the BuildBoundary tool. query = "SensorName = 'QuickBird'"